It’s undeniable that sunrooms produce an immediate positive reaction in everyone who steps inside them. Whether the sunroom consists of a deck with screened-in walls around it or an upscale solarium whose glass walls extend all the way up the cathedral ceilings, this space has one main reason for being: To let in the light. Create a master suite sunroom: Using a sunroom addition to increase the square footage of your master suite will add more intrinsic value to your home’s worth than any other sunroom purpose. By making it part of a master suite living area, this kind of sunroom addition gives you twice the attractiveness in one fell swoop. Your master suite is enhanced with a room full of sun by day and stars by night, and the home now has a glorious sunroom to call its own. Create a rec room: Sunrooms, solariums, and conservatories all offer views of the natural beauty around them. Dedicating them as recreation rooms is a catch-all way of saying, “This is where we all want to be to relax, play, and hang out together next to nature.” This kind of sunroom becomes a family room that brings the outside in, without weather or bugs. Create a home office: Many different careers lend themselves to a home office, from psychologist to Yoga teacher to masseuse. Surround your client with light and beauty and they will look forward to coming back. Create a breakfast room: When it’s drizzling outside, you can still enjoy the garden with your morning coffee in a breakfast sunroom full of life and light. Create a fitness room: Sunrooms are ideal spaces for your workout equipment, or yoga room. The innately pleasant atmosphere and freshness will encourage you to enjoy the outdoor landscaping and nature while your body gets stronger and healthier. A simple deck — While a deck is not a sunroom, it is the foundation of one. Build it first, and you’re almost there! A screened room — A ceiling and screened walls connected to your deck will give you protection in the wilds of your backyard. A three season sunroom — While not thermally broken for heating and cooling, a three season room can extend the seasons by providing protection from rain, wind and chilly temperatures. 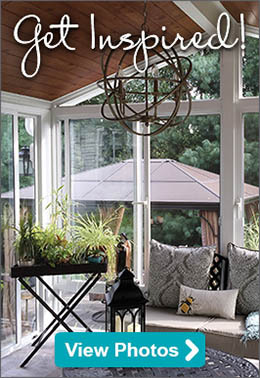 An all season sunroom — This type of sunroom is available for use all year long. 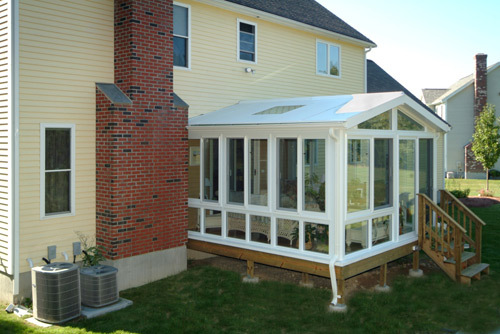 Consider insulation and climate control to make a year-round sunroom. A solarium — For sun and star worshippers, this is the top of the line.